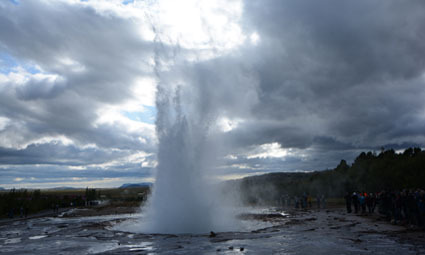 The Vulcanologist's Dream - on this tour we visit Geysir which lends its name to all the world's geysers. We also visit the nearby Strokkur geyser. Yellowstone, Dinosaurs and Grand Canyon - Yellowstone National Park has the largest concentration of geysers anywhere on earth including the famous 'Old Faithful Geyser'. An eruption of the Stokkur Geyser in Iceland.